A dinner party is a time for celebration and getting together, a time for family, friends, and food. But then when it's our own party, we want to serve amazing food without missing time with our guests because we're too busy in the kitchen. Ordering from AppetizersUSA is the solution to your entertaining needs. Now you can serve gourmet hors d'oeuvres and enjoy the party at the same time with our easy frozen appetizers and desserts. We offer a wide range of flavors and styles of appetizers - hot, cold, light and refreshing, decadent and delightful. We have so many options you could even skip the main course and just serve your guests one mouth-watering appetizer after another. It couldn't be easier - we provide excellent customer service, fast shipping, and easy preparation. Most of our appetizers are just thaw, bake, and serve. Here are a few of our favorite bites that just may whet your appetite to throw a party as soon as your order arrives. If these don't get your taste buds tingling, let us know what you're planning for your next party and we will help you select the perfect menu for your event. One of today's hottest ingredients is a classic appetizer staple. 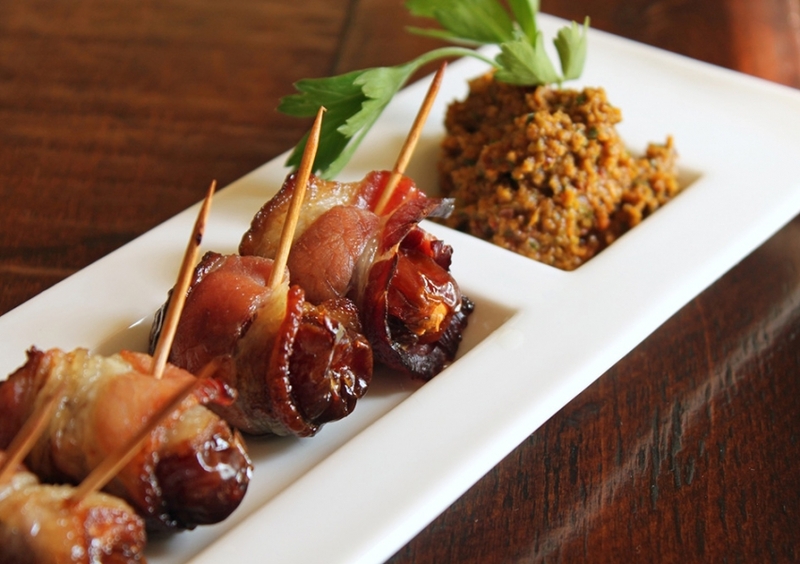 One of our most popular appetizers is our Dates and Bleu Wrapped in Bacon (pictured, below). Our sweet dates are stuffed with savory, creamy bleu cheese, then hand wrapped in bacon on a knotted skewer. These are fully cooked, just warm and serve. Our plump, 20/30 count tender bay scallops are delicately seasoned with a touch of herbs, spices, lemon, and garlic then wrapped in cured bacon. Check out more bacon-inspired appetizers here. 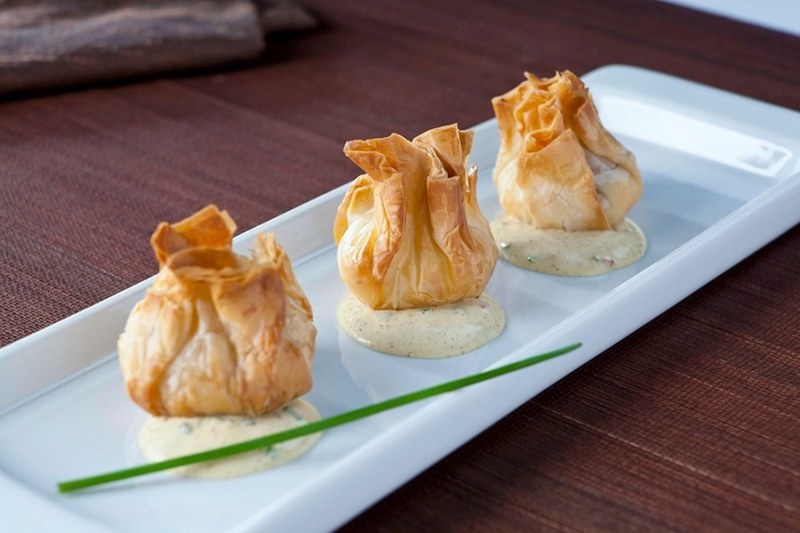 (pictured) This savory vegetarian option is made with apples, goat cheese, walnuts and caramel in a phyllo beggars purse. Wrapped in a crispy phyllo roll, this fresh cut asparagus spear garnished with Asiago cheese will become an instant classic on all your party menus. 100% vegetarian and 100% delicious. These gluten-free skewer features fire roasted tomato along with Kalamata olive, fresh mozzarella, and marinated artichoke heart. Just thaw and serve! These appetizers are perfect for everything from family holiday parties to stately dinner events. We take your favorite flavors from home and elevate them into bite-size bits of elegance. 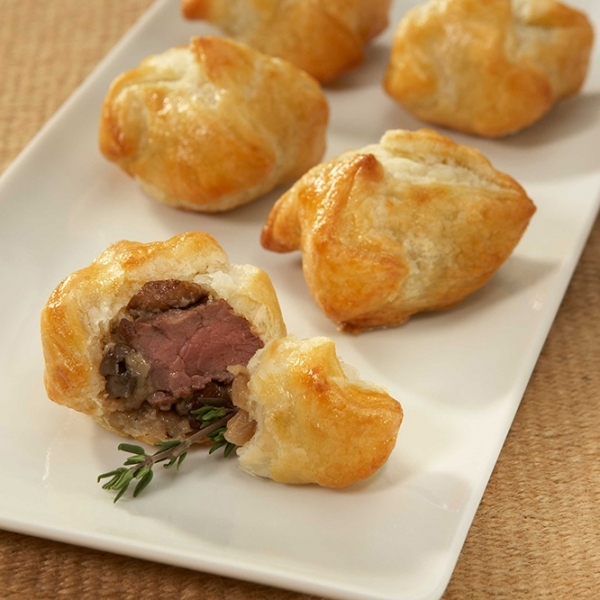 Made with a savory piece of fresh, USDA choice aged beef tenderloin, accented with mushroom duxelle and wrapped in a French-style puff pastry. Creamy macaroni and cheese with truffle oil and shaved black truffle slices. Browse our site for many more options, or let us know how we can make your party the best party you've ever hosted. You might just like us so much that the next time you plan a party, you'll find yourself thinking "Appetizers - they're what's for dinner!"